This is a thistle-like plant in the family Asteraceae, native to the Mediterranean region, from Portugal north to southern France and east to Iran. 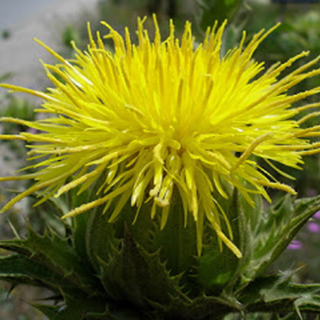 The cold tea of blessed thistle is a valuable bitter tonic , improving appetite and helping with the assimilation of fats. The warm tea will produce a sweat that is of use in bringing down fevers. The herb is also used as a strong galactagogue, used for improving the milk production and letdown reflex during nursing. Blessed thistle combines well with anise or fennel. Cold infusions in smaller draughts are valuable in weak and debilitated conditions of the stomach, and as a tonic, creating appetite and preventing sickness. The warm infusion - 1oz (28g) of the dried herb to a pint (500ml) of boiling water when needed - in doses of a wineglassful, forms in intermittent fevers one of the most useful diaphoretics to which employment can be given. It is said to have great power in the purification and circulation of the blood, and on this account strengthens the brain and the memory - take 1/2 to 1 drachm (2-3.5 ml). The dried leaves may be made into a powder and a drachm (3.5 ml) taken in wine or otherwise every day; a wineglassful of the juice may be taken every day. Being an annual, Blessed Thistle is propagated by seed. It thrives in any ordinary soil. Allow 2 feet each way when thinning out the seedlings. The seeds are usually sown in spring, but if the newly-ripened seeds are sown in September or October in sheltered situations, it is possible to have supplies of the herb green, both summer and winter. The leaves and flowering tops are collected in July, just as the plant breaks into flower, and cut on a dry day, the best time being about noon, when there is no longer any trace of dew on them.